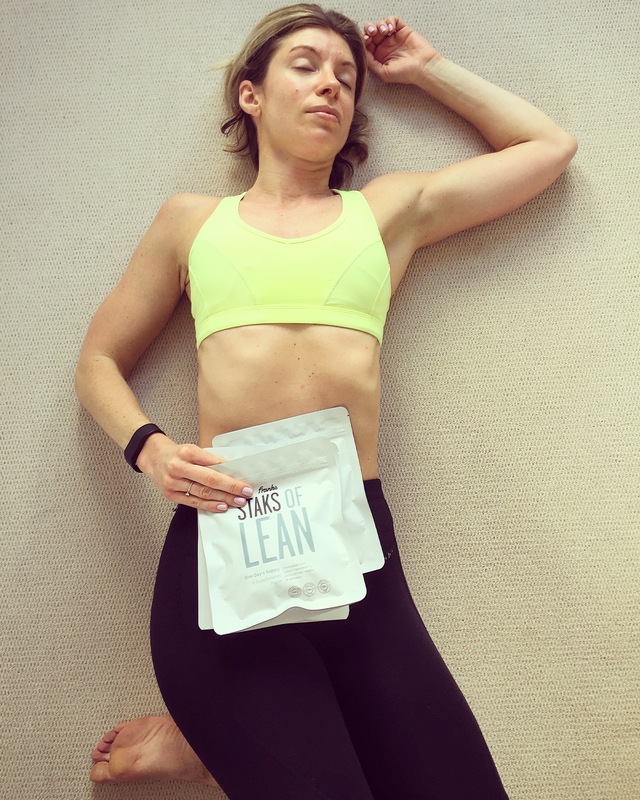 If you are one of my valued social media followers, then you will no doubt have seen over the past few weeks that I’ve been trying out a brand new lifestyle supplement range – in my personal case, I’ve spent the past month taking STAKS of LEAN – a daily supplement pouch that promised fat burning without muscle loss. Sounds like a dream, right? Was it? Well, let me tell you how I got on over the past 4 weeks…..
STAKS launched earlier this year and was founded by a former media lawyer, Josh Franks. Josh saw a gap in the market for a supplement brand that offered everything you needed in one convenient, easy to carry package – rather than hauling tubs of protein powder and bottles of pills around in a gym bag, STAKS was specifically created for those of us who are constantly on the go and need convenience from our pre and post workout nutrition and daily health supplements. STAKS are committed to using high quality, natural ingredients and have worked with an experienced nutrition team to create a complete range of daily supplement plans to fit with individual performance and lifestyle goals. As my goals are to stay slim but strong and have the energy to get through my hugely active days I opted to give LEAN a try, but you can also choose from SLIMMER, WELLBEING and WOW. A beautifully packaged box of 28 slim, sleek white pouches (like the ones you see in the photo above) turned up at my door, promising to fulfil my active body’s needs over the next month. Within each pouch was a daily vitamin, raspberry and green coffee bean capsules, Omega 3 capsule, a pre workout drink, post workout shake (both in powder form) and BCAA tablets. Literally everything I needed to fuel me through the day. You can see two of my daily supplements above, alongside my morning coffee! Whilst I always advocate getting what you need from a balanced diet rather than relying on pills and powders, I do also believe that those of us leading busy lives can often need nutritional support to help with energy levels and also recovery in between workouts. I’ve been taking supplements in various forms for several years now, which is why I was surprised to see results from taking STAKS of LEAN within the first week. I started taking everything on a Monday morning – vitamins and green coffee tablets with breakfast, BCAA’s and pre workout drink before either teaching classes or training myself, the post workout shake straight after exercise, and my Omega 3 capsule before bedtime. On Fridays I start quite early, have three clients back to back in the morning and then teach a Body Attack class at lunchtime (for those of you who don’t know, Body Attack is a high intensity interval based class – hugely energetic!) – in other words, this can often be my toughest workout of the week as my energy levels are pretty low from a busy week and long morning. However, having taken STAKS all week as per instructions my energy levels were sky-high and I powered through my workout like never before – I was actually gutted to reach the last track of the class as I felt I could have easily kept going! I genuinely haven’t had that feeling in a long time. Two days later it was a beautiful sunny morning, so I decided to head out for a 5k run – and again, felt like I had so much energy and was able to really push my speed – I recorded my fastest 5k time this year – and this is coming from someone who really doesn’t run that much….! I could also see abdominal definition that hadn’t been there for a month or so previously – after my holiday in Dubai back at the start of March I had somewhat relaxed my diet and so the STAKS trial came at the perfect time as I was intrigued to see if I really could drop body fat but hold onto lean muscle without changing my diet or my training routine. I found the supplements incredibly convenient, the pouches literally did fit in my handbag, and the powders were so easy to transport for my pre and post workout nutrition – as long as I had my empty shaker in my bag I was good to go. You may have read previously that I sometimes suffer from IBS (Irritable Bowel Syndrome) but the STAKS posed no problem to my digestion and didn’t cause bloating or irritation in any way. 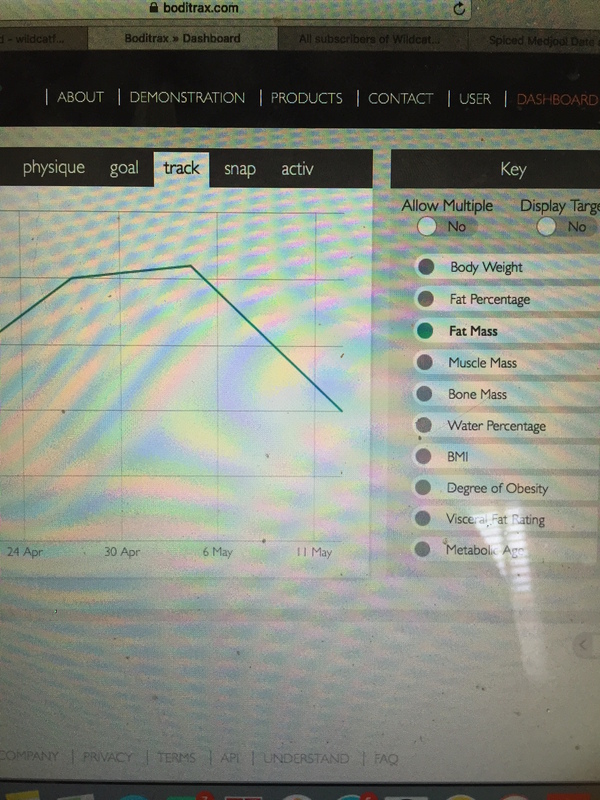 Sorry for the terrible quality photo, but I wanted to accurate portray the screen shot which quite clearly shows the decline in my Body Fat Mass in the last two weeks of the STAKS trial. Over the month, according to the Boditrax scanner, I had also gained 0.8% of muscle mass overall. So I can go on about the lovely packaging, the 50 years of nutrition research behind them, the convenience of having everything in one easy pouch that you can carry in your handbag, and the range tailored to your individual goal….. or I can just refer you back to the graph above. Significant body fat loss within 4 weeks. Do I need to say any more? 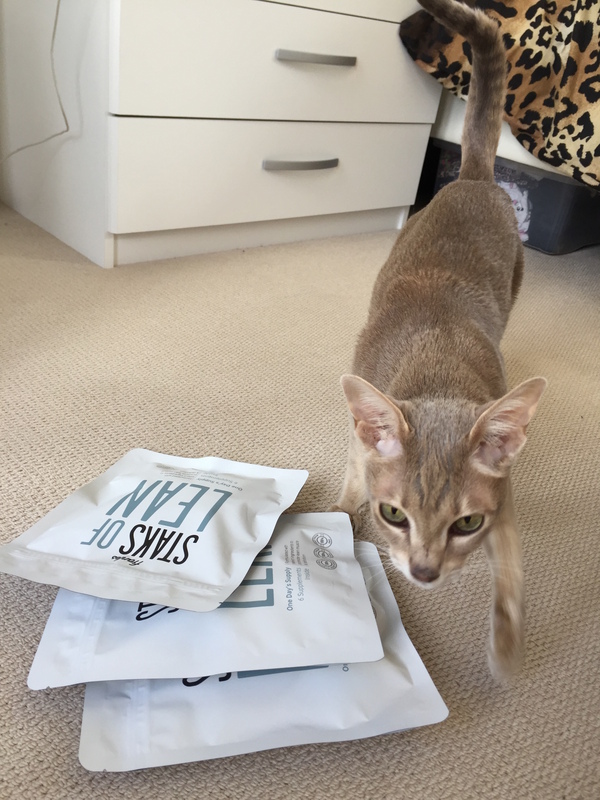 Oh wait I do….. Khloe the cat loves them too! 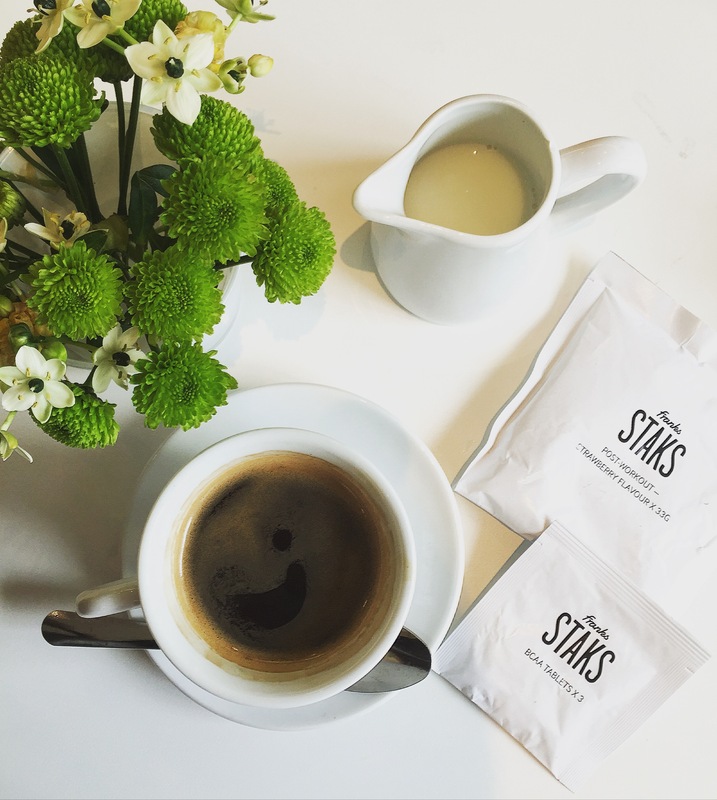 If you’re interested in trying STAKS for yourself, head to their website where you can order a weekly or monthly supply, and whilst you’re there check out the STAKS Blog, you might just find an interview with a certain Wildcat…..